The family of a British man murdered in Pakistan a year ago have urged the government to put pressure on the Pakistani authorities to find his killers. 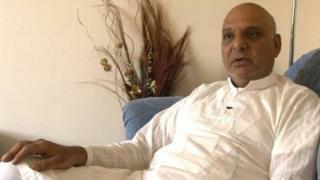 Malik Iqbal, 55, of Laisterdyke, Bradford, was shot in the head on 28 September 2012 at a house in Rawalpindi. He had travelled there to give evidence against a gang accused of kidnapping him a year earlier. Earlier this month, a coroner in Bradford recorded a verdict of unlawful killing but the inquest heard that nobody has yet been charged in connection with Mr Iqbal's death. Mr Iqbal was accompanied by his nephew Zaffar Mehmood on his return to Pakistan. Mr Mehmood, also from Bradford, says he is still traumatised by the events of the day exactly a year ago when his uncle was killed. "He was shot from behind. There was blood everywhere. It was bad and I still get nightmares to this day," he said. "All I want is for the British government and David Cameron to write to the Home Minister or Chief Minister or anyone in authority in Pakistan to ask them why this happened. "All the proof and the paperwork is there but why have the killers not been brought to justice? Someone out there knows what happened." The Foreign Office said it continued to provide consular assistance to the family and was still in contact with the local authorities in Pakistan. "We appreciate it remains a difficult time for Mr Iqbal's family as it comes up to the first anniversary of his death and our thoughts are with them at this time," a spokesperson added. "While we cannot interfere in the judicial process of another country, and must respect their systems just as we expect them to respect the UK's laws and legal processes, we continue to raise our interest in this case with the Pakistani authorities." Mr Mehmood explained how he had "popped out" 20 minutes before the shooting, otherwise he would have been targeted as he was helping his uncle prepare for the kidnapping trial. A year earlier, Mr Iqbal had been held captive for 20 days after being abducted during a family holiday in Pakistan. He was chained to a bed during his ordeal and fed only occasionally on tea and biscuits. He was released after a ransom of £15,000 was paid to his captors, but Mr Iqbal was determined to bring the offenders to justice. His decision to return to the country to give evidence was described as "extremely brave" by David Ward, Liberal Democrat MP for Bradford East. "He knew the dangers he was facing but he was keen to bring the perpetrators of the crime to court to stop it happening to someone else," said Mr Ward. Following the repatriation of his body, the inquest on 13 September also heard that West Yorkshire Police's offers of assistance to the Pakistani authorities had not been taken up. Det Sgt Simon Leek, who is leading the inquiry for West Yorkshire Police, said the force had been given very little information from Pakistan. "[We] have offered assistance to the Pakistani authorities a number of times, which has not been taken up," he said. "The information we receive predominantly comes directly from the family." Assistant Coroner Tim Ratcliffe said it was "disappointing" that police were not being given the information they wanted from Pakistan. Every year hundreds of British nationals of Pakistani origin are targeted by criminals, including kidnappers, as they're often perceived as being wealthier than locals. Government figures released in 2010 show 275,351 British nationals visited Pakistan. Of those, 245 required consular assistance. There were 27 deaths, four hospitalisations, and 28 arrests for a variety of offences. Recently-established law firm Infinity Consultants in Bradford provide assistance to clients of Pakistani origin. Their director, Nudrat Piracha, says Mr Iqbal's death could have been avoided as "he didn't have to go to Pakistan". "An organisation like ours could have arranged his evidence through video conferencing facilities," he said. "If it is dangerous we feel that we can help these people do things more safely."